Fossil﻿﻿ fuels had their day, we now understand the damage they do and are creating technologies that are less harmful to replace them. If anyone doesn't understand that they either do not have the facts or understand them, the alternative to that is they are just plain old evil. My conscience is fine, thanks for your concern. Since I'm unabashedly pro oil & gas, I'll just leave you to your own devices of trying to convince readers here on an energy forum called "Oil Price" that oil & gas are "just plain old evil". Good luck with that. I know that what ever I say here will not change things, no matter how true, not matter what the evidence, no matter what the data is. But as I'm stuck here recovering from a hole in the foot I had time to waste and it has amused me. But remember all we are in the end are memories in those that live and the consequence's of our actions. How will those involved in the fossil fuel industry be remembered by the future generations that have to live in the mess our generations have made? Also I did not say that oil & gas are "just plain old evil", but oil & gas have been a necessary evil but their day is setting and those that try and stop the sun from setting on them may find it a loosing battle and could get burnt in the process. Under certain conditions governments can successfully pick winners (and thus exclude losers) in the technology arena. For examples, the (U.S.) government has successfully picked the design of the nuclear submarine, and the design of the big rockets that put a man on the moon. Where it has gone wrong is in this area of power generation. Governments have dramatically chosen one electricity source (wind) over a previous technology (nuclear) and there does not appear to be any logical reason for it. Mostly I agree with the overall premise. but remember the U.S. Government picked nuclear for power as the future in the 50s. 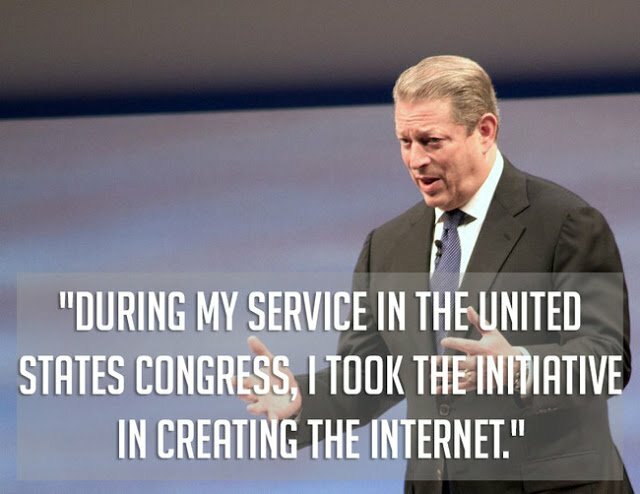 I wasn't around, but I bet the coal lobby was working overtime to slow down implementation. In certain aspects it government is more or less immune for the politics. The race to the moon was rather short, popular, and jump started by needing rockets for ICBMs. Well, nuke power is and remains the power for the future. It went sideways when the scientific illiterati, today called "the Greens," jumped on it and started the campaign that "radiation will poison your children - and grow them into dwarfs and Mongoloids." This is the problem with a society that is run by illiterati. In truth, nuke power is quite benign. Now with the molten-salt designs it is to the point where they can be built on an assembly line in a factory and trucked to site, lowered into place and connected to the transformers, then go for a beer. "Plug and play" has reached the nuclear reactor. You need to re-load the machine? Fine, put it back on the flatbed and truck it to the factory for refurbishing, you don't even have to do anything on-site. It does not get any simpler than that. Nukes probably will always attract emotional responses, partly because people associate with nukes, and the odd mess, and a basic distrust which bless them, government earns a level of distrust. Remember the Three Mike Island issues, Cherynobil, the Japanese mess. And the silly expense of some historical USA designs are still in my higher utility rates in my Texas memory for a project that was WAY over budget. Personally I believe nuclear is part of the solution. And yes, how can you not loath some of our political choices. But at least we have choices. One of Texas’s more successful governors once noted if you try and educate the public, you lose. You have to appeal to them. Having worked in the nuclear industry I think you are over simplifying the reality of nuclear power. The Green's are guilty of ignoring science when it suit's them, the same can be said for just about any group, including the fossil fuel world. But radioactive material is nasty as hell when not handled correctly. The nuclear waste we have kicking around is horrendous and many accidents have occurred even in the USA and the UK. Yes it's a political problem rather than a scientific or engineering problem to put it in safe storage but it's not happened. For a presentation I had to give I researched terrorism relating to nuclear power, it's a soft under belly, these sites are not secure. As for it being the energy source of the future I have no problem with it done correctly. It's just economics. Molten salt designs are no where near ready for commercial construction, even with funding they are decades off. With the rapidly falling cost of renewables and storage with other techs nuclear would be hard pressed to get close to being competitive. As for simply trucking them about especially after use, it would never work out to be an easy project. The designs are being built as prototypes in Ontario, Canada as this is written. I fully expect a series of smallish molten-salt reactors to be ready to go in a year or so. Probably between 100 and 500 MW to start, presumably the smaller sizes first. Ultimately, these will get down to the 20 MW size and be installed in any smaller town, for reliable local power. You underestimate how fast this technology will be developed. And yes, a small plant can be built as a complete gen-set and designed to be put in a container for a flat-bed trailer, trucked to the site and back again. I see that as totally inevitable. Everything I saw happening in the nuclear industry was glacier slow (preclimate change slow). To tell the truth I haven't heard of these, the only one I've heard of in Canada is MOLTEX and they are someway off, but once built a prototype would have to be run for sometime, then all the paper work (we got held up for 3 months just waiting for a minister to sign a piece of paper). Maybe it will be fast tracked some how. As for transporting and siting it isn't as simple as putting it on the back of a semi and going, then the site itself has to be very secure. It's all money and anything nuclear is dammed expensive. Every few years theres talk of fission coming back and great if it does make it this time. I can assure you this is getting fast-tracked. As for security, remember that this is molten salt. It is not as if you can go steal the stuff, or try to set it off into some Big Bang. You can forget about conventional security. That is what makes it such a neat technology. If the reactor part gets overheated, it melts out a plug in the bottom of the reactor vessel and the salt stuff goes out the bottom hole and into this cellar, where ti spreads out and loses criticality. Then it cools off by natural convection with the cellar walls. The pit is self contained so hardly a problem area. And yes, you really can build this reactor in a small package, put it into a container, and truck it to the job-site. That is what makes the design so neat. Need to repair, reload or refurbish? Simple enough: swap out the reactor with another one, you truck the fresh one out to the job and pull the used one with a crane, and drop the new one in place. Then the used reactor gets trucked back to the factory. On site, all you do is turn it on and let it run. These are self-regulating units. Neat,huh? I have an open question : Whilst windturbines and other renewable technologies may not be perfect are they not better than doing nothing? What stands in the way of a meaningful policy change to better this world (OK, I get this depends on definition improvement..)? And finally, is there any REAL science that says climate change is not a major issue? You have raised a number of interesting questions. Here are my personal thoughts.Anybody else have some ideas, please be sure to chime in, this is an open-discussion forum! Q.1: are turbines better than doing nothing? A: Unfortunately, they are probably not. This sounds counter-intuitive. Remember that when you go with a specific technology, it takes capital and allocation of scientific resources, including both research and manufacturing resources, away from other concepts. For example, way back when, there were two competing designs for a portable fuelled engine: internal-combustion, and external-combustion (the Stirling engine). Society went with the Internal-combustion mostly because it had backers and thus absorbed both intellectual power and capital resources. Yet the external-combustion Stirling engine is a neat design and avoids the pollution aspects of fuels ignition under pressure, specifically particulates and nitrides of oxygen. It also is inherently multi-fuel. When society goes with propeller-type wind machines, it will exclude other designs, as the propeller type will absorb research brainpower and capital. Governments then come along and boost that allocation by providing investment tax credits. So you end up with one design to the exclusion of others, even if other designs are either better or less damaging. Propellers are inherently damaging, both to birds and bats, and to people living nearby, and even to the earthworms in the soil underneath. For example, if you went with a sail arrangement as the Dutch did in the 1500's, then you don't have those negatives. Sails are not obsolete technology; there are cruise ships being built with sails additional to engine power. The other problem with wind propellers is that they have low utilization, typically producing perhaps 24% of nameplate capacity, and create these instabilities in the grid if used to connect to the grid (the most common format). So you have society spending a lot of capital on a resource that is providing only a fragment of the power it could or should, as opposed to say putting that capital into a new nuke plant. Q. 2: What stands in the way of meaningful policy change? A. Dumb people. When you have a society that is not technically nor scientifically literate, you get silly policies, and it acts as a total barrier to meaningful policy changes. Our societies seem to elevate some seriously dumb people into decision-making roles. - In other words, if I were in charge, you would have meaningful policies. But I am not in charge. Q. 3: Is there REAL science that says climate change is not a major issue? A: Major to whom? What aspect of "change" concerns you? If you are worried about a rise in temperature, I would say, be happy it is nice and warm. The longer-term prospect for the planet is Ice Planet Hoth, and you can anticipate that it will get cold and colder soon enough. Figure in another 400 years and an Ice Age will get started, with sheets of ice 5,000 feet thick descending down from the North Pole. That will be unpleasant. If your concern is salination of the oceans, yes that is a problem. One solution is to stop dumping road salt all over the place as a de-icer. If your concern is a rise in ocean temps and the disruption of the Atlantic Upwelling, then that is another problem. I offer no solutions for that. If your concern is a rise in water levels, with seawater devouring coastal cities, I would suggest that is very unlikely, as the excess water will be evaporated off the oceans and drop on land back as rain, thus re-charging legacy aquifers, assuming the various governments are intelligent enough to keep that water from washing off the soil and rushing to the ocean. Dams and diversion techniques should keep that at bay. If you want to lower water levels dramaticaly, then re-filling the Aral Sea, and re-charging the dry rivers and aquifers underneath the Sahara and the Saudi peninsula, will absorb lots of rainwater. And you can absorb excess ocean water by digging a canal to the Qattara Depression; that would generate a Gigawatt of power and run indefinitely. Cheers. 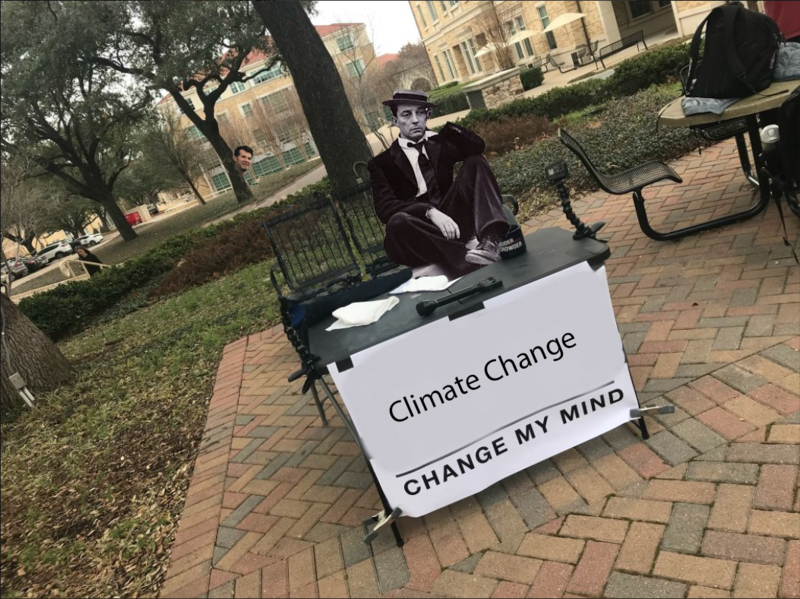 Hmm, I sense a confusion when it comes to climate skepticism: the skeptics here--correct me if I'm wrong--do not dispute the fact that climate is changing. What they do dispute is the extent of humankind's involvement in this change. And all the the drama is not helping anyone think more clearly. the﻿ ﻿skeptics here--correct me if I'm wrong--do not dispute the fact that climate is changing. What they do dispute is the e﻿xt﻿ent of humankind's involvement in this change. It's still denying the over whelming scientific majority. Now I'm not an expert on climate change, only having 1/9 of a degree in science I took some time ago just specific in that topic, then several courses in the time after. There is cold hard data that shows human's are the biggest reason the climate is changing, anything else isn't scepticism it's denial. When I was taking that degree the models showed that it wasn't going to be an issue for many years in the future, the last course (think that one was through the Exeter University) was showing it's all ready began to be an issue. There should be a load more drama about climate change, just sea level rise is beginning to impact many coastal areas (it doesn't take much with increased storm activity). Really I see people complaining about the general population and greens ignoring science but it happens here as well. You can not cherry pick science to play to your narrative and expect respect. It's still denying the over whelming scientific majority. No, it is not. Skepticism is not a euphemism for denial, I promise. There is cold hard data that shows human's are the biggest reason the climate is changing, anything else isn't scepticism it's denial. Not really. There is no reference data about previous periods of higher temperatures, so we don't really know what part of this now is caused by us. Some, for sure, based on cold scientific facts extrapolated for the purpose of studying climate change, but exactly how much remains uncertain, whatever all these climate scientists say with a loud, certain voice. Public discussion of scientific topics such as global warming is confused by misuse of the term “skeptic.” The Nov 10, 2014, New York Times article “Republicans Vow to Fight EPA and Approve Keystone Pipeline” referred to Sen. James Inhofe as “a prominent skeptic of climate change.” Two days later Scott Horsley of NPR’s Morning Edition called him “one of the leading climate change deniers in Congress.” These are not equivalent statements. The mission of the Committee for Skeptical Inquiry is to promote scientific inquiry, critical investigation, and the use of reason in examining controversial and extraordinary claims. ... The Committee is a program of the Center for Inquiry, a nonprofit educational organization. The Committee was launched in 1976. The Skeptical Inquirer is its official journal. You're very welcome. I'm on a quest against what I see as a half-conscious semantic substitution campaign driven by political motives. I think it is at best naive to believe that the world can function without fossil fuels for the forseeable future. Even if (and I think this is big if) we in the next 20 - 30 years were able to replace fossil fuels for power generation and transportation I do not know a replacement for petrochem products. Please enligthen me if there is. Whilst maybe not the only culprit I believe that climate change contribute to Global migration which in turn causes "dumb people" (not a phrase I would normally use, but I actually think that it is quite fitting) to vote crooks into power, which prevents meaningful policy change. Welcome to the sensible club, Rasmus. However, I note that China seem to be investing in green technologies - my understanding is that they are doing this to combat air pollution, not because they care about the enviroment. During my many years in China and other parts of Asia it has occurred to me that the perceived leap in technologies, from current levels in the West to that found today in Asia, is not always indicative of caring more or wanting to throw away older less efficient technologies. Example: China made a "leap" away from landline telephones into mobile, and also a "leap" from VHS tape to CD home entertainment. These were not "leaps" per se (shut up, Percy! ), but absolutely because of the FACT that when China reached a level of development where phones and home videos became an option, there was no reason to start with old technologies and every reason to start with the most advanced. To say that a country is investing in new technologies when they build new plants and install current or slightly forward looking technologies is just plain wrong. China has been able to build a very current and in many cases state of the art society because they were able to start with a clean slate, so to speak. Example: China experienced a complete stripping of every kind of technology, wealth and progress during the Cultural Revolution which gave them the ability to completely rebuild from scratch. It makes perfect sense that they would do so with current technologies instead of old ones, and current knowledge of what works and what does not with respect to planning and governance (infrastructure). Mistakes have been made and continue to be made, but that is certainly to be expected given the pace and the population and size of the country itself. If you are building new power generation facilities, I would assume that the cost of installing those facilities is not nearly as much as it would cost to convert from old to new. Thoughts on this anyone? The opposite side of the example above is India. India's society, culture and infrastructure have been around for centuries and is deeply entrenched. It is nearly impossible at this point to start over, tear down the old and install the new, or even to upgrade quickly and as necessary. Therefore, and I mean no disrespect, it is a monumental task to solve the many challenges facing India of competing against China and the West. They do impressively well, make no mistake, but trying to compete on an equal basis is just not in the cards. Exactly, when you are going against the vast majority of scientists it is up to you to provide the extraordinary evidence. As I'm Carl would agree on this one. I'm not the one making extraordinary claims. I'm questioning the extraordinary claims about humans causing climate change. 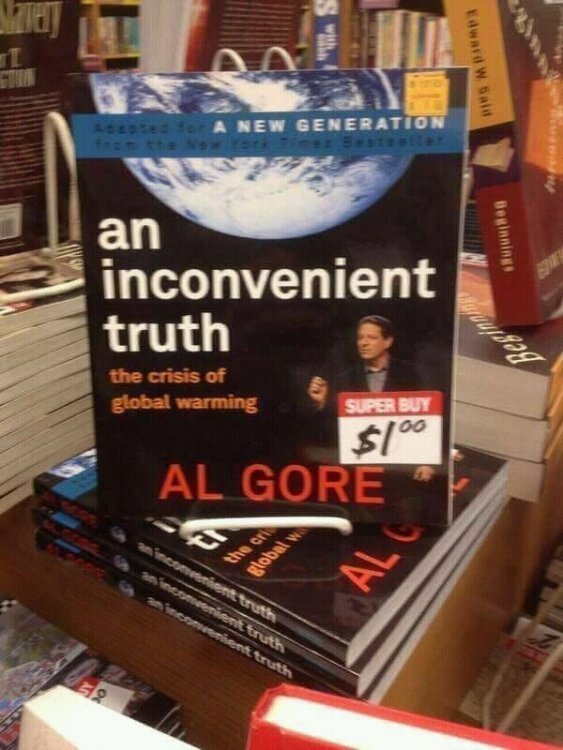 If Al Gore is the huckster snake oil salesman / spokesperson for climate change armageddon caused solely by humans, then you have a lot of work to do to convince me of Al Gore's extraordinary (hysterical) claims.